This is not done with Juvederm Voluma. 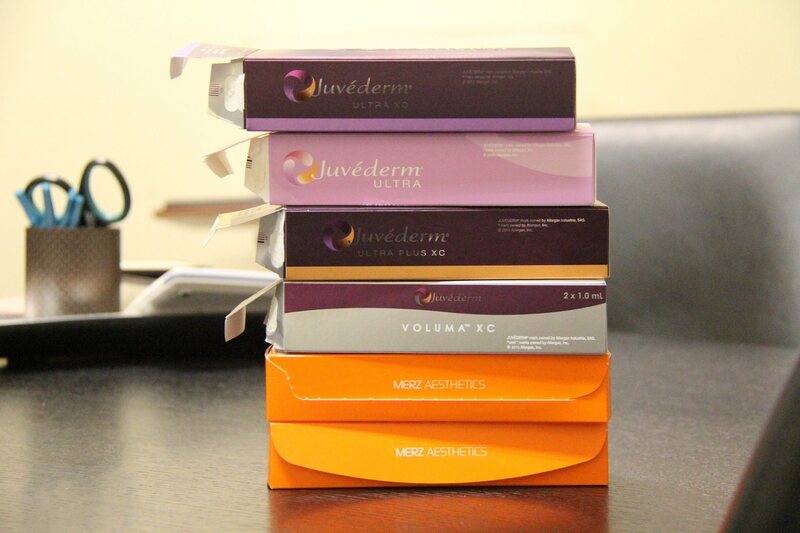 As of November 2013, I do not have experience with Juvederm Voluma. 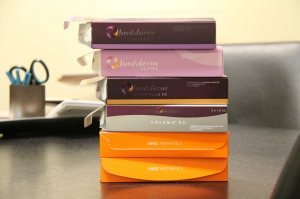 Juvederm Voluma, however, is on it’s way to the office in Modesto, CA and I will soon have experience with this new dermal filler. [update: I’ve used my first syringe of Juvederm Voluma on 12/24/13. It was a very satisfying and positive experience. I look forward to having even more experience with Juvederm Voluma. 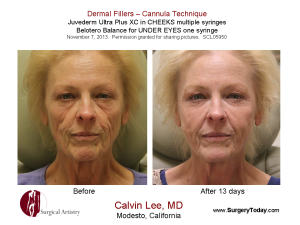 I was able to use my 27g 1.5 inch cannula for Juvederm Voluma injections]. To improve my cosmetic dermal filler craft, I’m analyzing my past week. 95% of this result was performed with CANNULAS as an instrument of liquid implant delivery and a whole bunch of other secrets. There’s more that I would like to do with fillers for her, but my instructions were only to work on under eyes (tear troughs) and cheeks. Patient had lost a good deal of weight and it is showing in her face. Options include face lift. However, she chose to use Juvederm, Belotero, and Botox. 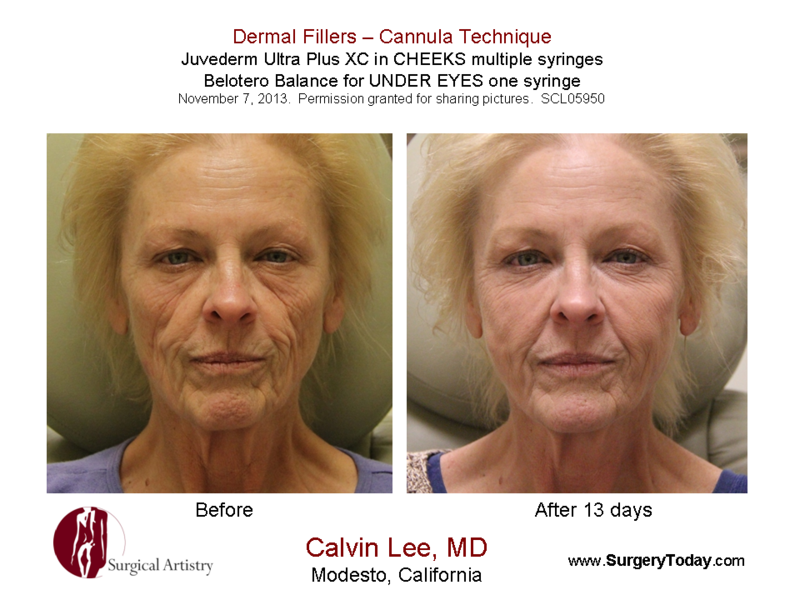 In the before picture she had Botox and Juvederm expertly done at another plastic surgery practice in our town of Modesto, CA. I added upon that work to get the 13 day “after” picture using only Belotero and Juvederm. Info about Brilliant Distinctions in our Modesto Cosmetic Injections practice. Picture used with permission. Thank you very much for letting me share this experience. This is an off Label, FDA usage of Juvederm ultra plus XC for cheek fillers. For the past 2 months. I went around the country to participate in lectures, courses and conferences regarding Botox, Juvederm, and other cosmetic injections. I also made it a point to personally get to know some of these injectors. Most of the injectors whom I met were from the United States, but some notable ones were from Russia and Hong Kong. These doctors don’t just inject Botox – it was just for a catchy title. A better word to use would be Comsetic Injections. I wanted to bring back the world’s best Botox information and bring all that to my Botox practice in Modesto, CA. The injectors whom I talked with were Medical Doctors (ie. Dermatologists and Surgeons). There are highly successful, effective, and well-known injectors who are physician assistants and nurses, but in my past 2 months I didn’t have time to meet them or seek them out. Perhaps another time in the future. 3. They are eager to be on the cutting edge with new products – this allows them to speak publicly about the product and become an early adopter and early expert. 5. They are very willing to share / talk / publish. In fact I get the sense that they really like publishing. Much of them got famous from publishing often. 6. They make injections a priority in their practice. Some of the surgeons diminish the surgical part of their practice. Some of the Dermatologists diminish the medical dermatology portion of their practice. 7. They often go back to knowing the anatomy, and exploring new anatomical concepts – which contribute to what they call paradigm shifts in the thinking regarding filler use or conceptualization of aging. 8. They are not be afraid to show off their grey hair – but will make some attempt to hide their wrinkles. Just making a light-hearted comment here. 9. Most importantly they do not view fillers or Botox as a COMMODITY. In other words, it’s not a Botox per unit price or cost per syringe of Juvederm (the PRODUCTS), rather it’s the injector’s SKILL which is the true value. And this is how they provide the best VALUE – through the best skill and materials. However, the rest of the world seems to be viewing Botox and Fillers and a commodity – like something you’d buy off of Amazon.com for example. I have much to bring back to my Modesto, CA practice. I learned a lot of the techniques. I’m not sure if I’ll ever publish much (besides writing some topics in this blog) and thus I’ll just be famous in my small local area.